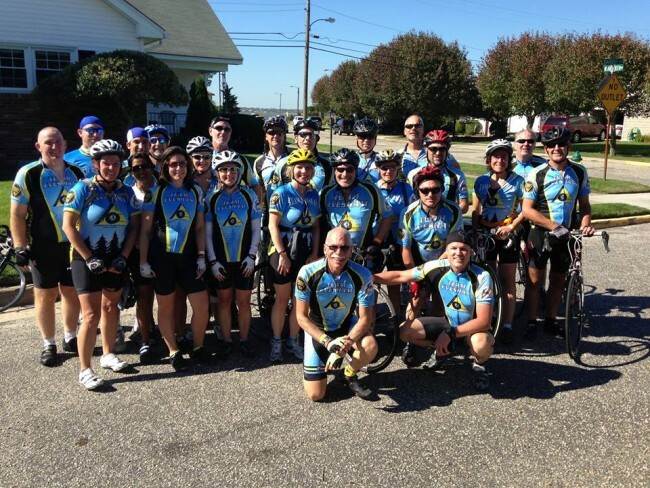 In 2008 Team Evesham was formed with only 8 riders for the MS City to Shore Ride. Our team goals were simple, we wanted to promote health and fitness and encourage a sense of community. Bring folks together. Plus we wanted to support charity events. Numerous riders have started out as novices and now they are moving up and teaching others the joy of cycling and being part of a team. The friendships that have been made during the years have been just incredible, folks meet when riding and now they are lifelong friends. We are fortunate to find so much besides just cycling. This year we watched so many personal goals being surpassed. We even have teammates going off on vacation together and helping out with random acts of kindness. This is our tenth year anniversary and we will be celebrating cycling and friendships all year. The State of New Jersey honored Team Evesham with a special proclamation and celebrated our remarkable record of community leadership, service, and exemplary volunteerism. Our mission is to enhance wellness by promoting bicycling as a means to good mental and physical health. Our goal is to encourage participants in our team to ride in events that benefit and support other non-profit organizations. The team designates two events each year for our official charity events. This year we will ride in the Cancer Society Bridge to the Beach and the Foster 100. Team Evesham Cycling is a public charity and non-profit corporation. Please visit our website at TeamEvesham.org.